Is the All-Seeing Eye a christian symbol stolen by Freemasonry or something invented by the enemies of the Church? It started out as a Christian symbol. It's debatable whether or not it's worth fighting to reclaim, but yeah, you can find all-seeing eyes in some churches. Freemasonry is known for stealing Christian concepts and ideas, and "secularizing" them. For example, in the organizational structure Freemasonry, there is an Order of "the Red Cross of Constantine" based on the Catholic "Sacred Military Constantinian Order of Saint George", the Masonic "Knights Templar" based on the Catholic "Knights Templar," the Masonic "Order of Malta" being based on the Catholic "Order of Malta," etc. More than that, Masonry has it's own "Rites", which are basically individual organizations which are directly affiliated with each other within Masonry, much like how there are different "Rites" in Apostolic Churches which are in "communion with each other." Heck, their God as the "Great Architect of the Universe" is a reference to Western Christian iconography, as is possibly their famous "compass and square" logo. It wouldn't surprise me if it was pagan in origin but the Church decided there was nothing intrinsically wrong with it, so why not keep it. For example, in Russian and Ukrainian traditions, Lent involves a total abstinence from meat and dairy, and there is a massive festival dedicated to eating cheese called "Maslenitsa," mainly to get rid of all the dairy in the house. However, there is significant evidence that this is a Christianized pagan holiday, which originally was a day of sun-worship to mark the end of winter. The Church took it and made it Christian. Same with the Western practice of "Christmastide," which doesn't coincidentally parallel "Yuletide." For a modern example, in Alaska, the pagan Native Alaskans had a practice of making "Spirit Houses," so that the deceased could begin their journey to the next life. The Russians who Christianized the state had no problems allowing such burials to happen for their dead. I am not of the opinion that anti-christianity derives(steals/hijacks) its symbols directly from Christianity. Indirectly yes, but directly no. I am of the opinion that anti-christianity planted such symbols under a different guise in the name of Christianity in order to lend them merit. They then move the goal posts and encourage conclusions that seem to fill this conversation here thus far. The funny thing is though, they confess to it. Freemasons say before they were, they were the builders of the cathedrals. And, it is believable for a number of reasons. Their great architect emphasis does not betray that either. It is from the horses mouth. The all seeing eye as far as I am concerned was conceived in sin. "If the eye is sound, the whole body is sound." Assuming that's even true, that doesn't change the fact that the Church saw nothing wrong with using it for centuries. Now, what I find really fascinating is how the Muslims interpret the All-Seeing Eye. Muslims, similarly to mainstream Christians, believe that there is an upcoming Antichrist, and Jesus will return to destroy him - although from what I know, they take it very literally in believing that Christ will literally kill him. What's fascinating though is that, according to Muslim oral tradition, the Prophet Muhammad allegedly said the Antichrist (as they call, it "Dajjal") will have only one eye, and according to some accounts, he will also have the name "unbelief" written on his head that only true Muslims will be able to see. When Muslims see the image of the All-Seeing Eye in Freemasonry, many interpret Freemasonry as a conspiratorial organization whose single, explicit, primary goal is to bring forth the Antichrist, primarily through the destruction of religion and demoralization, not seeing the "single eye" symbolism as a coincidence. That is only a fact if you trace our problems back to the french revolution and certainly no farther than the protestant revolt. As for me, I am not in that company. The compass and square is a thinly-veiled hexagram in which the meanings of the two triangles in respect to the act of creation are, at least partially, symbolically represented. Lucifer, the covering cherub, was the guardian of this very light, and it is quite suitable as a symbol to represent him; that this is the intentions by Masons is clear enough when one digs into the possible indentity of the "Grand Architect". As for the Masons' self-alleged antitquity, they are steeped in an "Hermetic" take on Kabbalah that was only developed after the later Middle Ages, which makes it unclear. Kreuzritter - If I had to take a guess, my guess is that it represents a volcano erupting to bring an end to wicked mankind that resides in its shadow. God gave us the rainbow as our sign. What is the date of this painting? and what does it represent. 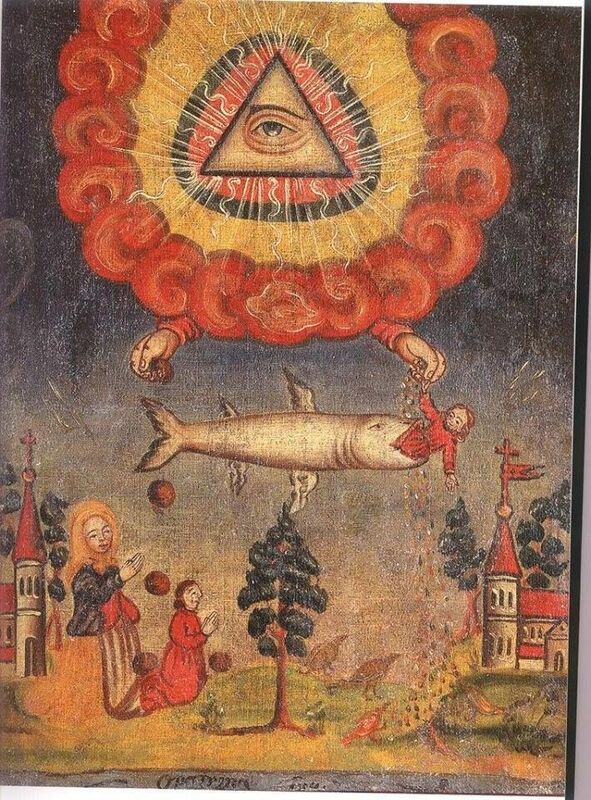 I did reverse search on it and it is only linked to orthodox forum and pinterest image with description in german (Discover ideas about Sagrada-The fish, an important symbol in alchemy ("Fischlein Echeneis"), is associated with the lapis. Here one also thinks of Jonah.